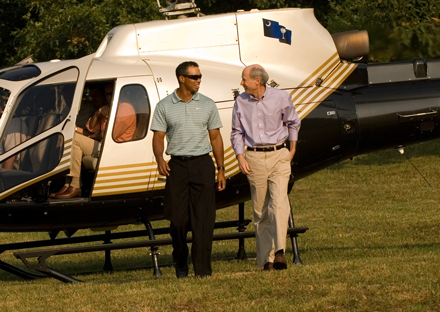 Travelers Rest, S.C. – Golfer Tiger Woods can’t seem to catch a break. In a week when a tell-all book by his former golf instructor Hank Haney caused a lot of consternation, Woods’ only golf course design project in the United States is now in Chapter 11 bankruptcy protection. The Asheville, N.C.-area golf course real estate development, Cliffs at High Carolina, was projected to be the newest private club community in the sprawling Cliffs Communities network. However, the once high-flying Cliffs Communities, comprised of eight world-class private residential golf clubs on 20,000 acres in the Carolina Preserve, officially succumbed to the real estate recession when Cliffs founder Jim Anthony sought U.S. bankruptcy protection this Tuesday in South Carolina. According to a report in the Wall Street Journal, Anthony’s controlling Cliffs Club & Hospitality Group Inc. had estimated liabilities between $100 million and $500 million. At one time, the Cliffs clubs were some of the top-selling communities in the country. But land sales to home builders and individual buyers seeking high-end real estate were slowed by the economic downturn putting a halt to the Woods course. To date, only two homes have reportedly been built at High Carolina and fewer than 50 of a planned 1,100 lots have been sold. One of the Cliffs’ members, Steve Carlile, owns a prime lot at High Carolina and is one suitor interested in purchasing the Cliffs assets. Earlier this month, the board reached a tentative deal with Carlile Group, a diversified company based in Marshall, Texas, to take over the Cliffs Club for an unspecified sum. Now that the company is under bankruptcy protection, it also will entertain offers from other investors, according to Katie Goodman, managing partner of GGG Partners LLC, the restructuring firm hired by Cliffs Club. The Carlile bid will be used as a “stalking horse” to attract other offers, people familiar with the situation told the Journal. Woods’s first golf-course-design project, Tiger Woods Dubai, was never finished. His other project, an oceanside course on Mexico’s Baja Peninsula, has also been slow in developing.